Here are a couple video clips that are close to my heart. 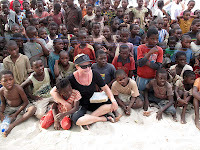 The first is of Iris Ministries in Mozambique, Africa. This is where I spent my summer 2010, they actually filmed this while I was there. This is a little snapshot of what my life entailed for 3 months. Powerful and Amazing. I would love to go back! "An introduction to the work of Iris Ministries"
This next video is from Lyle Phillips who is the founder of Mercy29, the NGO I mentioned in an earlier post. I have the opportunity to work with them here in Thailand as they would love to start up a base here. Lyle is 26yrs old and went to my school in Africa a year before me. He left with a huge passion for kids and bringing them love and justice. We have to be the voice of those who don't have one. He is going full-steam ahead, changing the world one child at a time. Powerful stuff! "Lyle B. Phillips, our founder, shares his story about the origins of Mercy29." This is an amazing anti-profit that you should definitely check out more at Mercy29 Think about ways your business or church could partner with Mercy29... we can change the world.